Boston Red Sox starting pitcher Clay Buchholz (11) pitches during the first inning against the New York Yankees at Fenway Park on July 10. Right-hander Clay Buchholz, the longest-tenured starter on the pitching staff of the Boston Red Sox, will be back with the team in 2016. 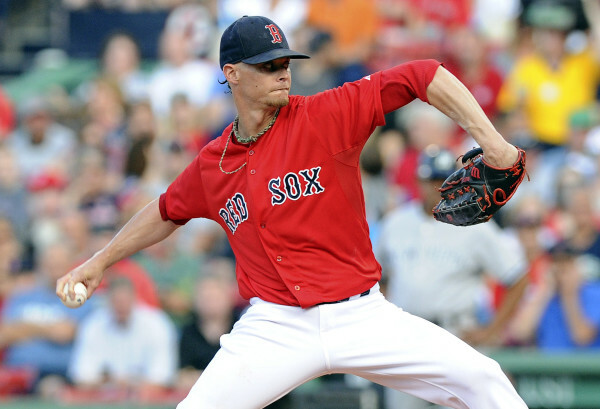 Buchholz, 31, had his option for 2016 picked up by the Red Sox and will earn $13 million next season. Buchholz had a 7-7 record with a 3.26 ERA and 107 strikeouts in 18 starts in 2015. Injuries derailed another season for Buchholz, who was placed on the 15-day disabled list on July 11 with a right elbow strain and missed the remainder of the season. In his last 11 outings of the season beginning May 15, the right-hander allowed only 17 earned runs in 75.2 innings for a 2.02 ERA. Buchholz, a two-time All-Star, is 73-51 with a 3.85 ERA and 806 strikeouts in 169 career major league games, including 167 starts. Buchholz was drafted in the Red Sox in 2005, but his contract could draw interest from other teams in a trade as Boston’s new president of baseball operations, Dave Dombrowski, is pursuing an aice for the team. Along with Buchholz, the Red Sox also have starting pitchers Rick Porcello, Joe Kelly, Wade Milley, Eduardo Rodriguez and Henry Owens under contract for next season. The Red Sox also need help in their bullpen, which was a disaster last season. Dombrowski, who didn’t have great bullpen success in Detroit, needs to rebuild it. Closer Koji Uehara still has another year on his contract, so he will be back in some role.